Today we are going to discuss Dental Crowns ,what they are and the reasons that you may actually need this type of procedure. I will also cover some of the different dental crowns available for my patients. I think you will benefit greatly by taking a few minutes to learn about dental crowns and how they may help to bring back your best smile. A dental crown is a cap or restoration that covers the coronal of the top portion of the tooth. 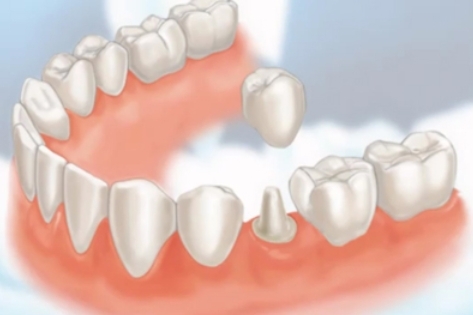 Several different types of crowns are used in Dentistry for restorative purposes. The traditional PFM “porcelain fused to metal” restoration has been used for many years by Dentist’s. The esthetics of a PFM may or may not be what a patient is looking for based on where the crown is being placed or how much metal is used (which appears black sometimes at the gingival/gum line area). All ceramic crowns have a much more esthetic result, especially on anterior restorations, more esthetic result, especially on anterior restorations, more incisal translucency, tinting and a more realistic natural look.Most ceramic crowns are passable, which is layered material, and some are milled solid Zirconia ceramic crowns which are extremely strong and more so than a traditional PFM. Why would a patient require a crown or a cap? Depending on the size of a cavity or decay in an infected tooth, a crown may or may not be needed to properly restore a patient’s tooth. Usually when part of the cusp or whole cusp a tooth is comprised due to decay, a patient will require a crown for additional support splinting the circumference of the tooth together. Composite restorations or resin fillings sometimes are not adequate in the circumstance of replacing the cuspal areas of a tooth. Some teeth also may have recurrent decay around an older amalgam or silver filling/restoration with by the very nature of silver fillings tending to be larger and deeper will require a crown to adequately restore the tooth for longevity and proper function. Now that you have a little more information about dental crowns it will be much easier to make informed decisions about your dental health.